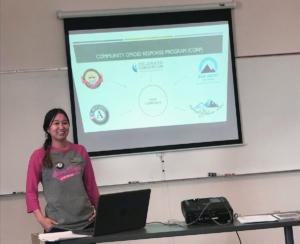 The Colorado AmeriCorps Community Opioid Response Program (CORP) is a statewide initiative to support local communities that are implementing strategies to reduce the impact of opioid abuse. From Sept. 1, 2017, through Aug. 31, 2018, 12 AmeriCorps members will work with the six regional Area Health Education Centers (AHECs) and several partner organizations around Colorado. The work will be focused on counties hardest hit by the opioid epidemic. Central Colorado Area Health Education Center (CCAHEC) is the awardee for the Corporation for National Community Service (CNCS) grant with Serve Colorado. The CORP relies on a partnership between CCAHEC, the Regional Area Health Education Centers (AHECs), Rise Above Colorado, the Colorado Consortium for Prescription Drug Abuse Prevention (the Consortium), and the Colorado Attorney General’s Substance Abuse Trend and Response Task Force (Task Force). The overarching goal of the partnership is to link the existing infrastructures of the AHECs, Rise Above, the Consortium, and the Task Force with local community coalitions. The CORP will use a “constellation model” approach that has been identified as a best practice, designed to bring together multiple groups or sectors and work toward a shared goal. The CORP grant and AmeriCorps members will help the four partners increase support to local communities working to reduce the impact of opioid misuse. During the course of the program, three evidenced-based strategies will be used. • Coordinate delivery of youth-focused opioid-related educational programming and resources. The AmeriCorps members will also disseminate related messaging campaigns, initiate, support, and enhance community-based collaborations, and assist in other opioid efforts. The AmeriCorps members and partner organizations will work to jointly achieve pre-established goals. The members will coordinate at least six two-hour provider education events statewide per year. The goal is to educate more than 300 clients, with more than 150 reporting an increase in knowledge about safe opioid prescribing practices. The members will coordinate at least six community education events statewide. More than 1,200 clients will participate, with 900 reporting an increased knowledge of safe storage and disposal practices. The members will coordinate delivery of educational programming created for youths ages 12 to 17. The members shall reach 3,000 clients, with 500 reporting an increase in knowledge about opioid usage.